You often find it on packaging of your skin care: honey. Besides being the sugary sweetness that frees us from things like colds and sore throats, what else is it good for? 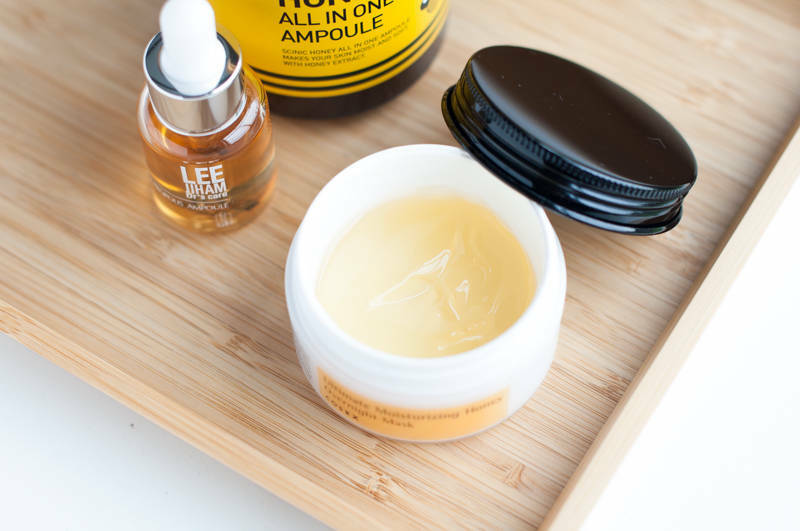 In today’s post I’ll be discussing the benefits of honey in your skin care routine and why you need to introduce honey into your skin care routine asap. Throughout history, honey has been used for its healing purposes. The ancient Egyptians, Chinese, Greeks and Romans used honey for wound-healing and stomach disorders. Even today, honey remains an important substance in modern skin care. Along with fructose and glucose, Honey also contains many amino acids, vitamins, minerals and enzymes. Honey has more naturally-occurring antioxidants (substances that reduce the negative effects of free radicals) than almost any other botanically/naturally derived source. honey: nutrient dense, anti-oxidant, humectant , anti-bacterial and healing. Great for all skin types. Honey is a humectant which means it attracts and seals in moisture. At a ph of 3 – 4.5, it balances out the oil level of your face, meaning it is suitable for all skin types. It will lend moisture to dry areas while retaining moisture and elasticity for oilier skin types, making the complexion supple and glowing. Honey is a natural antioxidant, which proves beneficial when taken internally or used topically on the skin. Current research has determined the effectiveness of honey as a natural form of suncreen and it helps to prevent early signs of ageing (fine lines, wrinkles). Honey is an ancient way of treating wounds to help promote healing and prevent infection due to its anti-bacterial properties. This also indicates honey can be used to relieve and calm acne, while lightening scars. Winter can take a toll on your lips. One of the best ways to protect them is by laying a protective film on top. 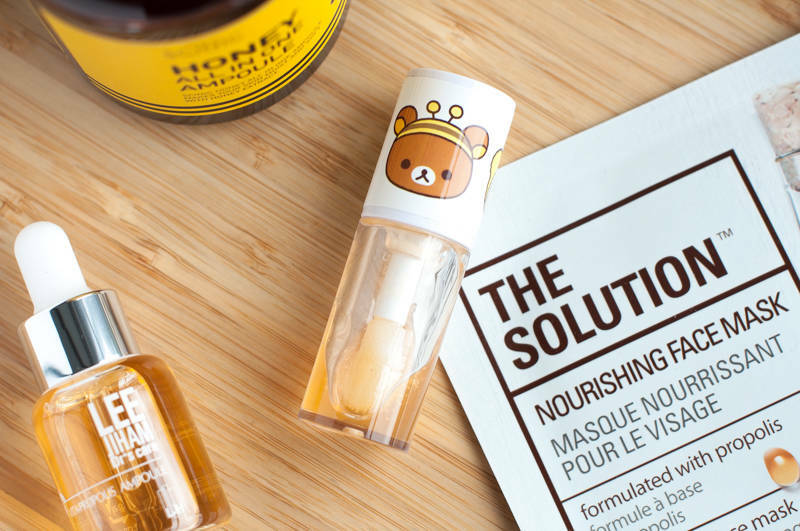 Using a honey-based lip oil, you will not only protect your lips from the harsh weather conditions, but also nourish them. And you don’t even need to put down a lot of money to do so. 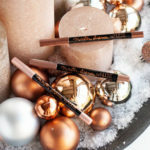 I loved this lip oil from A’Pieu. Find my review here. Still couldn’t find the ingredients list, but I would buy it again in a second. I just wish they would bring the Rilakkuma packaging back. When you see it for the first time, it’s hard to imagine this tiny jar can pack a serious punch. 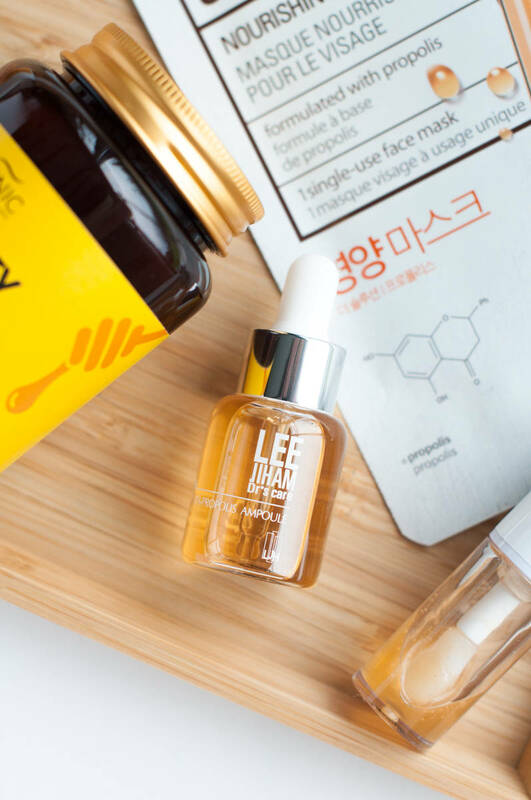 The Lee Ji Ham Vita Propolis Ampoule contains 50% propolis extract and 20 % multi-vitamins. It’s so powerful, you only need 1 drop to add to serum/essence or moisturizer. This non-sticky lightweight multitasker helps to even out skin tone, smooth texture, improve dullness, and revitalize the complexion. 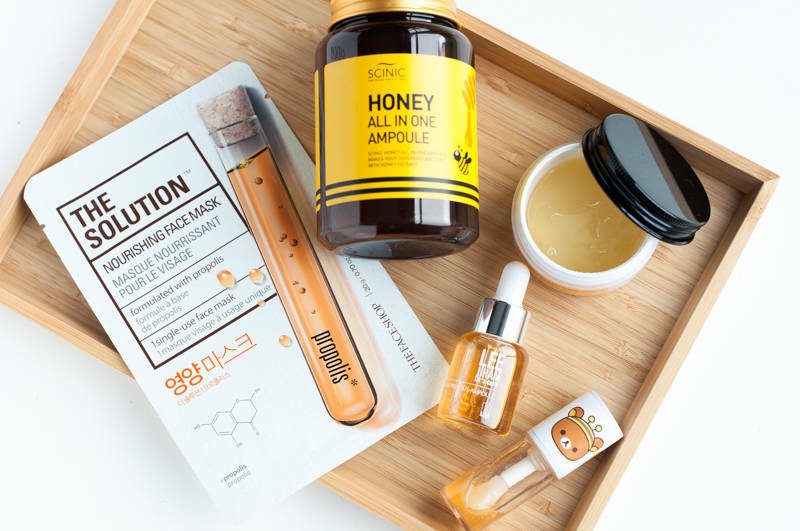 Ingredients: Propolis extract, Portulaca Oleracea Extract, Hippophae Rhamnoides Fruit Extract, Panthenol, Rosa Centifolia Flower Water, Niacinamide, 1, 2-Hexanediol, Ethyl Ascorbyl Ether, Hamamelis Virginiana (Witch Hazel) Bark/ Twig Extract, Centella Asiatica Extract, Carbomer, Arginine, Spirodela Polyrrhiza Extract, Hydroxyethylcellulose, Dipotassium Glycyrrhizate, Adenosine, Sodium Hyaluronate. The Cosrx Ultimate Moisturizing Honey Overnight Mask is a mask containing 87% propolis extract and natural beeswax designed to soothe, calm and moisturize the skin overnight. It can be used as an overnight mask, wash-off mask, or even as a cream. I mostly used this as an overnight mask and loved it. This is perfect for those combo/oily skin types that are looking to hydrate the skin without using a thick cream. In case you’d search for it: Cosrx changed the packaging to a tube I believe last year. I need to get myself another one of these asap! This giant ampoule is what saved my skin during Winter. One glance at the ingredients list shows this is pure magic in a jar. 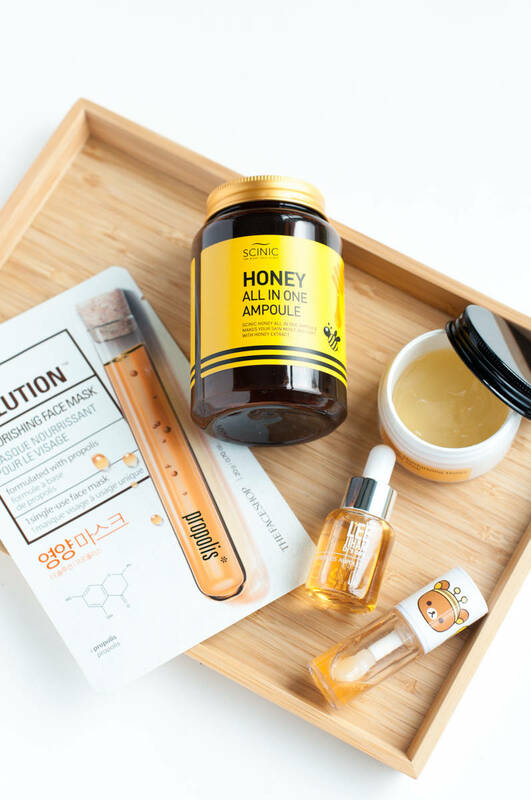 Its first 5 ingredients are 90% Honey Extract (moisturizing), Glycerin (humectant), Water (solvent), Niacinamide (brightening, moisture barrier, ceramides, acne, collagen, and so much more), and Royal Jelly Extract (high in Vitamin B, anti-inflammatory). It has some popular traditional herbal medicine extracts like Licorice Root (brightening) and Scutellaria Baicalensis (antioxidant, anti-irritant). There are more lower down on the list, which also contribute some antioxidant and anti-inflammatory properties. 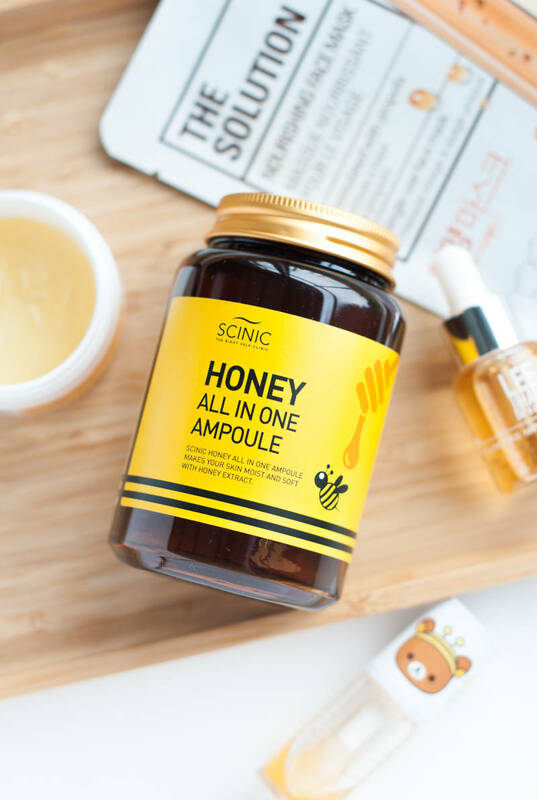 The SCINIC Honey All In One Ampoule got rid of all of my dry patches and made my skin feel supple and smooth. I’ve been using this royally morning and night since October and I still haven’t run out. Great value for money! You can start incorporating honey into your skin today. Sheet masks are a quick pick-me-up for your skin that you can use anytime. 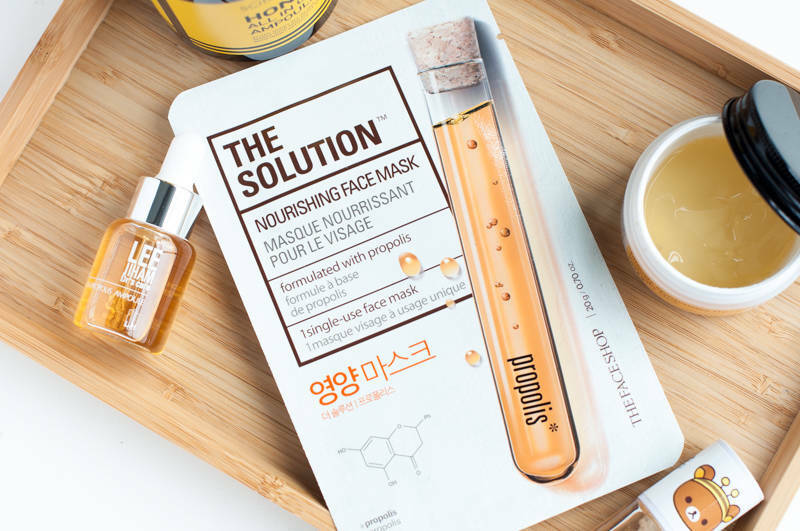 The Solution Nourishing Face Mask from The Face Shop is an affordable light-as-air sheet that feels soft and weightless on skin. The serum containing Propolis provides a nourishing solution to exhausted skin. The perfect solution to relax your skin after a long day. Ingredients: Water/Eau, Propanediol, Alcohol Denat., Peg/Ppg-17/6 Copolymer, Glycerin, Panthenol, Paeonia Suffruticosa Root Extract, Propolis Extract, Saccharomyces Ferment, Butylene Glycol, Adenosine, Sodium Hyaluronate, Allantoin, Hydrogenated Lecithin, 1,2-Hexanediol, Hydroxyethylcellulose, Citrus Paradisi (Grapefruit) Fruit Extract, Hydroxyethyl Acrylate/Sodium Acryloyldimethyl Taurate Copolymer, Carbomer, Sodium Polyacrylate, Ethylhexylglycerin, Peg-40 Hydrogenated Castor Oil, Potassium Hydroxide, Disodium Edta, Phenyl Trimethicone, Dimethicone, Parfum/Fragrance.